Hi there..... 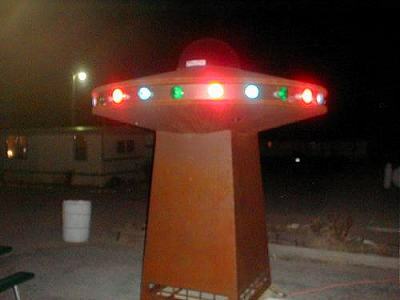 I was checking out your website and its what inspired me to ask my family if we could go on a little trip down by area 51.....I'm just a 17 year old girl, and I am so interested in Area 51 and Rachael, NV...... I have my own little trip report i'd like to share with you. We went on January 21st, so it was still pretty cold outside, which is a good thing, since vegas is so hot.... anyways, we left vegas and headed up to area 51... to just check it out... We weren't really setting out to do really anything, just to explore a little, and just escape the city. We reached Groom Lake road, and started heading toward the entrance of the base. As we were riding down the dirt road, We, all of a sudden, got a flat tire. So of course we had to stop, get out of the suburban, all 6 of us, so my dad could put the spare on. My dad looked at the tire to see what happened to make it blow a hole, we noticed the shape of the hole, was an x... there was nothing caught in the tire, like glass, or sharp rocks, nothing!!! I bet someone shot our tire out or something. While standing there, freezing to death waiting, I noticed up ahead something bright. It was the sun reflecting off of a car that was parked atop a hill. I took out the binoculars and peered through... It was a ford pickup truck with 2 people in it... the cammo dudes, I thought. I looked through the binoculars for a very long time. I put them down for a second, and when I looked through them a second later... The ford pickup was gone. It was heading right toward us. Before I go any further, let me say that those guys are jerks. The reason why I say this is because as the approached us, all 6 of us, standing outside freezing, trying to put on the spare, they drove by with an rude smerk on their faces... like they were laughing at what happened. They drove down the dirt road a little then turned around and passed us up again, to only go to the top of their hill. While standing there, we got to see the white bus leaving the base... they were going so fast, they didn't even slow down with us standing in the road and all... the bus was probably going like an easy 50 m.p.h. Well, we got the spare tire on, and continued on. We finally reached the posts saying to turn around, so we did and proceeded to Rachael. As we were driving on Groom Lake road, heading back to the E.T. highway, the cammo dudes were tailing us. I don't know what they were doing, probably escorting us off of Groom Lake road, but they turned on their high beams a lot. Well, my dad, trying to mess with them, turned off his lights, then turned them on, and just doing little things like that to mess with them. It was pretty funny, I guess. Eventually, they turned around, and we headed for Rachael. 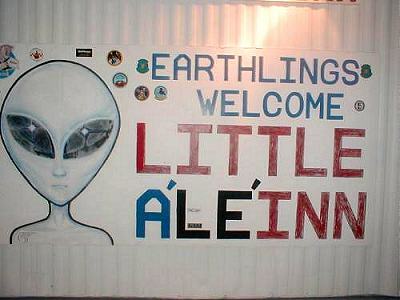 It seemed like forever before we got there, but when we did, we stopped at the Little A'LE'INN for a bathroom break. It was probably too late to eat something there anyways, it looked like the people there were cleaning up. We took a few pictures, and started to head home. Driving back to Vegas only 40 miles from Rachael, we somehow got another flat!!!! I still think it was the government or something. So there we were, sitting in the pitch black darkness, on the side of the road, waiting for someone to help us. We put on our hazards and waited, and waited. I noticed a lot of planes, or jet lights in the sky flying overhead and wondered if they were going to the base. You could see car headlights 8-10 miles away, and when they approached, some just kept on driving, and some stopped. One person had a 3-way radio in his car and tried contacting someone. They got ahold of someone, but I never found out who, but they never helped.... another car drove by, stopped and promised to get help when they reached Rachael. No one came. so we were out there for about 3-4 hours. So waiting out there... WE SAW SOMETHING!!!! We saw an orange and red light..I said out loud, its just another car's tailights.... well, it wasn't, because it would change colors, from blue, to green, to yellow, then back to orange and red. It then sped up towards us, so fast.... I don't think a car could go that fast. It was creepy, to the point that my dad got the chills. It then started raising up off of the ground and hovering in the air, swaying back and forth, until it landed back on the ground, and it dissapeared. We were all pretty stumped and didn't know how to react, we just all wanted to get home. So finally, a truck approached us, and in it was an old man, and an old woman, heading toward their home in Rachael, stopped to ask us what was going on. He had a shed with things to fix a flat tire, so he offered to take all of us to his home with him while he fixed the flat. So we all piled in the truck and headed back to Rachael. Well, we got there like 20-40 minutes later, all shivering and miserable. We went inside their home while Jim (the old man) and my dad went to fix the flat. Inside, comforted by the warmth, their friendly dogs, and a cup of hot cocoa, we girls had a chat with Kaye, the wife of Jim. (yes it was the Medlins, to my surprise) She told us many stories of their own UFO experiences and gave us each a pin with an alien on it to REMEMBER what happened, lol. Well, my dad and Jim couldn't fix the flat, so he gave us a whole new tire!!! Such a nice guy!! Well, we got back in the truck, when he offered to let us see his cow, so we agreed and went to see his cow before we left. He eventually took us back to our suburban, helped put on the tire, and welcomed us to their house anytime!!! They offered to show us the old mine around there next time we come. Well, we got their phone number, and gave them ours and made our departure. Thank God we finally got the tire on, we were all scared, cold, and outraged by our sighting.